The best event is when the audience is the show. You’ve found the party service like no other. 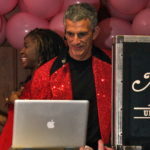 Entertainment specialists since 1976, Mobile Music Unlimited, Inc. proves that when the audience is involved, everyone has more fun. 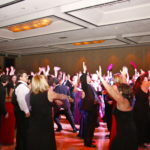 Our upbeat approach makes guests the life of the party! We bring your audience on stage, dress them up in hats, give them props and put them in musical skits. 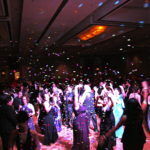 Combined with giant screen dance music videos, live camera video, light shows, karaoke, game shows, special effects and dance instructors, our party motivators will get your guests up and in the middle of the action. They’ll talk about your event long after the party is over! We offer different packages from simple parties with high-energy DJ and music to full-fledged, large productions with light shows, confetti, special effects and live camera video projection.Interactive MMU takes entertainment to new heights. 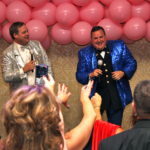 We bring your guests on stage, dress them in costumes and give them wild props – hula hoops, inflatable guitars, confetti launchers, maracas, feather boas – and they become the show in musical skits. Everybody has great fun! We produce game shows, including “Fabulous Feud;” full stage; professional host, video equipment, props and sound reinforcement. Use our content, or create your own questions to see how well your guests know your company. We’ve produced special events across the country for hundreds of thousands of guests, since 1976. 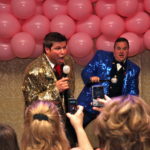 We rocked the Computer Associates Convention in the New Orleans Arena, created a memorable time for the Bank One meeting, and performed at the Venetian Hotel in Las Vegas for the Blimpie International Annual Convention. Other clients have included Oracle, Microsoft, McDonald’s Corp., Hyatt Corp., Cox Communications, Disney and Southwest Airlines and we’ve played with Wayne Brady, the B-52s, Third Eye Blind and the Bangles.Our sister company, Funtastic Fotos On-site Digital Imaging mixes green screen technology with a custom-designed background image to make uniquely personalized photographs – perfect party favors. Your guests see themselves in the mouth of an alligator, on a Mardi Gras float, or on the cover of a magazine! We have provided imaging services for many companies and produced unique keepsake photos at the annual Endymion Extravaganza and Orpheuscapade during Carnival time.